This is a time full of television that requires sure and steady hands. There are cooking shows, home renovation shows, and fashion design competition shows. There are shows where you compete by painting makeup, forging swords, and failing at cake-making; there’s a show about popping pimples and lancing boils, and several about tattoo artists. Yet it’s possible that “Black Earth Rising,” a co-production between BBC Two (on which it aired in September and October 2018) and Netflix, is more interested in what’s tactile than any other series on television. The characters who populate its complicated world are constantly touching things, as if to confirm they are still there, as if they could will those things to remain just so. There’s a simple explanation for this, a series on which very little is simple: When your hand rests on something, it can be verified, witnessed, documented, and trusted. What’s out of reach may as well not exist at all. At its best, Hugo Blick’s series lives in the spaces out of reach. 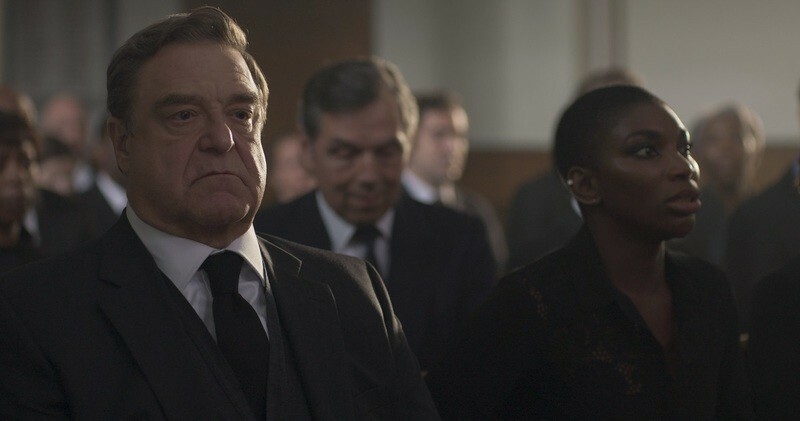 “Black Earth Rising” centers primarily on Kate Ashby (Michaela Coel in a bracing, intensely vulnerable turn), a British investigator who, as a child, escaped genocide in Rwanda in the arms of her adoptive mother, Eve Ashby (Harriet Walter), an international lawyer who specializes in the prosecution of war crimes. She accepts the role of prosecutor in the case against Simon Nyamoya (Danny Sapani), a Tutsi General credited with bringing about the end of the Rwandan genocide, but who Eve charges with a horrific crime unknown, it seems, to all but the General, her colleague Michael Ennis (John Goodman), one or two others, and herself. Kate is horrified, deeply wounded—a Tutsi herself, she cannot understand why her mother would choose to prosecute the man who ended the nightmare. An explanation cannot be given, but is promised down the road, and then all hell breaks loose. That’s the beginning. The beginning of the beginning. What’s most striking about “Black Earth Rising”—outside of the constant touching, the terrific performances, and the thoughtful filmmaking, anyway—is that it’s essentially a legal thriller mixed with a painful search for personal history, leaving threads dangling for so long that it’s easy to forget them entirely until suddenly they are yanked on, and something else unravels. It moves like a thriller. It shocks like a thriller. But imagine any legal thriller you like—say, early “House of Cards,” or maybe “Primal Fear”—and then involve the ruthless murder of millions, an army intent on slaughtering an entire ethnic group. Now imagine that the only people willing and equipped to fight for the truth and for justice are in incredible pain. Endless, unceasing pain. They’ve still got to solve the mysteries, race through the car chases, fend off threats from all sides, and maneuver through endless obstacles, and they’ve got to do it while struggling with their own, knee-buckling tragedies—some difficult to imagine, some upsettingly familiar and mundane. A bleak diagnosis. A sick daughter. A hateful aunt. Grief. Remorse. Isolation. It never stops. Yet “Black Earth Rising” isn’t what you’d call relentlessly bleak. Oh, it’s difficult to watch—sometimes extremely so; watching this eight-episode season for review was so grueling, a step back and half a day away from it was necessary. But Blick gives his characters, particularly Goodman’s Michael, Coel’s Kate, and Tamara Tunie’s Eunice (an assistant Secretary of State for the U.S.), a sense of humor, dark and sharp though it may be. More palpably, the brisk pace maintained by writer-director Blick throughout keeps the proceedings from approaching anything like self-indulgence (at least, right up until the end). Emotions matter here—they define Kate, and are the force against which most of the other characters struggle against, are guided by, or both at once—but as the characters tell each other again and again, the moment in front of them is rarely the destination. Blick approaches the story that way, too. When quiet moments, static moments, occur, they always center on what a character is experiencing. If Kate needs to stop and get herself together, or Martin needs a moment to reflect or assess, that’s fine, that’s important. But because they never forget that the world keeps turning, because their urgency never lessens, the threads of the story remain taut. That’s why the touching, reminding, pressing, gripping, holding is all so important. There’s will and force behind those instances of contact. They are prayers, or promises. They are also certain, and that certainty stands in contrast with most of the series. While “Black Earth Rising” dwells in the gray, it thrives. (That genocide is an unspeakable evil is never in question; almost everything else is.) The characters have firm, singular conviction, but they acknowledge the complexity that envelopes them, and almost everyone has warring interests and needs within themselves. The characters, too, are complex, particularly Martin, Kate, and Alice Munezero (the remarkable Noma Dumezweni), a former General now looking for the only right moment to push for dramatic change. But as the series moves toward a powerful conclusion—and powerful it is—Blick begins to paint with some broad strokes. 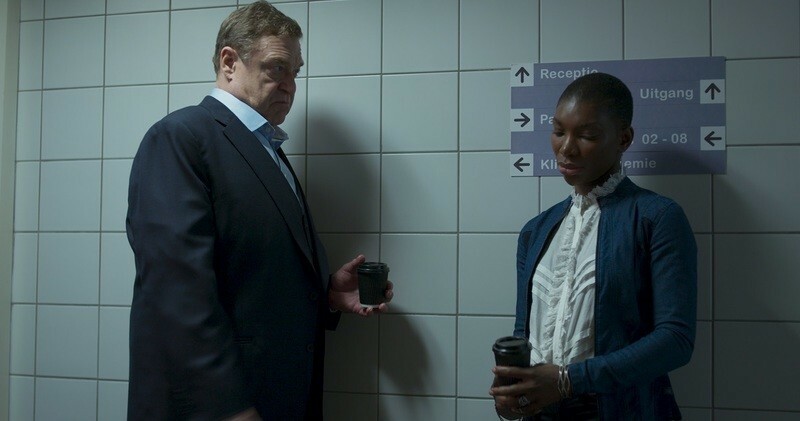 By this point, “Black Earth Rising” has earned a few of those moments, but it’s frustrating to watch a show so willing to keep the viewer off-balance suddenly become narratively tidy. To unreservedly recommend “Black Earth Rising” is impossible. Its precise cocktail of genre and human nightmare won’t be for everyone. But this can be easily said: If you seek excellent performances, you’ll find them here—Coel, Goodman, and Dumezweni in particular. If you’re hoping to be simultaneously challenged and made deeply anxious, look no further. And if the quest for rightness in a world that too often makes rightness impossible compels you, “Black Earth Rising” is well worth your time. Just give yourself something to grab, or touch, or press while you watch it. The steadiness will help. The Blu-ray Box Set of the Year: "The Complete Jacques Tati"